Twenty-four years ago, NASA's Voyager One space probe sent back the mesmerizing image of what Carl Sagan called "a pale blue dot," Earth captured from a distance of 3.7 billion miles. The image seemed to condense all our earthly concerns into one tiny fleck of light, as Sagan put it, "a very small stage in a vast cosmic arena." "This is what Earth would look like to an alien, looking at us with a telescope like Galileo had." "This is what Earth would look like to an alien, looking at us with a telescope like Galileo had," said Juno's principal investigator, Scott Bolton. Juno is looking for clues into the formation of the solar system’s largest planet. Launched in 2011, the spacecraft completed a speed-gathering slingshot orbit around the Earth, necessary to propel the spacecraft 400 million miles to Jupiter. Plus: 1400 ham radio operators say "hi" to Juno. That fly-by gave Juno scientists a rare opportunity to film what Bolton called the "cosmic dance" between the Earth and its moon. The fly-by also provided a chance to try out some citizen science. During the four hours that Juno dipped closest to the Earth, at least 1400 amateur radio operators from around the world transmitted a greeting in Morse code, hoping the collective signal would be strong enough to be picked up by Juno. It worked. Those six beeps -- four, then two -- say, in Morse code, "Hi!" It's the first time a NASA spacecraft has picked up radio signals sent intentionally from citizen scientists on Earth, says NASA's Scott Bolton. 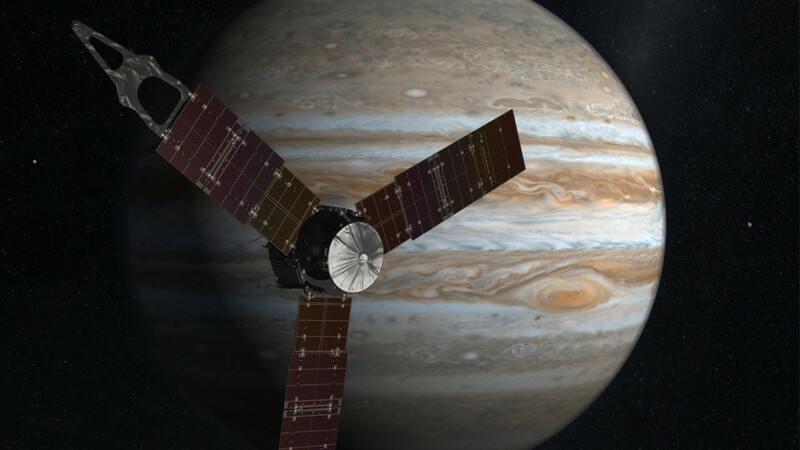 If all goes according to plan, Juno will fall into orbit around Jupiter on July 4, 2016.